Zorra of Kochtopf is hosting a blogging event for Apple Day , and I have decided to sneak in at the last minute with an apple dish that I made a little while ago but never got around to blogging about. The apple dish in question is apple custard tea cakes, and the recipe comes from The Australian Womens Weekly Cupcakes recipe book. The Australian Womens Weekly is a staple in many Aussie households, and has now produced a dizzying array of excellent cookbooks. The Cupcakes book is a beautiful visual feast which makes you want to run out to the kitchen immediately to reproduce the wonderful artisitic and flavoursome creations within its pages. I first heard about this gorgeous book from my friend Kerry, and it is now one of my favourite recipe books. I will not reproduce the recipe here for copyright reasons, but basically, it involves making a custard powder flavoured cupcake batter, which is baked in a muffin tin, with a layer of custard between two layers of batter. The apple component comes in with layers of thinly sliced apple being decoratively placed on the top of the cupcakes before baking, and afterwards, brushed with butter and sprinkled with cinnamon and sugar while the cakes are still hot. I used red delicious apples because that is what I had in the house, but you can use your favourite variety. These little cakes are not only very pretty, but absolutely delicious. The combination of apple and custard is sweet yet delicate, and is a sure crowd pleaser. The Apple Day roundup will be hosted by Kochtopf in October. Postscript: The round up can be found here. Thanks to Zorra of Kochtopf for organising this fun event! This is my first entry in Hay Hay It's Donna Day (HHDD). I am a great fan of Donna Hay, so I am thrilled to be participating in this blogging event established to honour her kitchen expertise. This month's HHDD is being hosted by TriniGourmet, who has chosen the theme of tarts. There are so many gorgeous tarts that I could have made for this event; however, practicality took over, and I searched for a recipe that would primarily use what I already had in the pantry (namely, a pot of sour cream that is fast approaching its use-by date!). For this reason, I settled on a peach tart from Donna Hay's Modern Classics Book 2. Unfortunately, peaches are not in season in Australia at the moment, so I substituted pears for the peaches. Whisk together sour cream, sugar and whole egg in a bowl, then pour into the tartshell and bake in a preheated oven for 10 minutes at 180 degrees Celsius. Remove the tart from the oven and increase the oven temperature to 180 degrees Celsius. Whisk the egg white until it forms soft peaks, then stir through the sugar and pear slices until coated. Spoon the fruit mixture on top of the tart and bake for 20 minutes or until golden. Cool. I was a little disappointed with my pear version of this tart. I kept the pear slices fairly chunky (approximately cutting each pear into eighths) to match Donna's peach tart photo, but I found that the fruit didn't quite cook through, even though the egg white topping was well and truly done. I also found that the juice cooked out of the pears and pooled on top of the tart. Maybe these problems would have been avoided if I had used peaches. However, although the cream filling of this tart is smooth, creamy and pleasant on the palate, it didn't have that "wow" factor for me, so I probably wouldn't make this tart again. Thanks to TriniGourmet for hosting this round of HHDD, and I look forward to seeing all the really great tarts in the roundup on October 6! Berries are not yet in season in Australia, but with summer fast approaching, they soon will be here in abundance. I love blueberries, raspberries and strawberries, and have a particular weakness for raspberries with icecream, custard, meringue - or au naturel :). We have been getting some Queensland strawberries in Victoria at reasonable prices for a while, but I am looking forward to when the season is in full swing so that I can stock up to my heart's content. Having tasted summer in Queensland over my holidays and been deprived of baking for 2 weeks while I was away, my longing for both summer and baking was ignited when I found this recipe for blueberry coffee cake on Clotilde's wonderful blog, Chocolate and Zucchini. I also figured that because this cake contains fruit, it is nutritionally valuable ;). Because fresh blueberries are still very expensive (about $8 for a 150g punnet), I used frozen blueberries. No matter - this cake looks and smells delicious. I haven't tasted it yet because it is going in to work tomorrow, but I did taste the batter - and it was heavenly! The vanilla-scented yoghurty goodness of this cake was evident in the raw batter, and I can't wait to try it tomorrow. 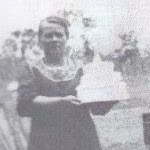 Postscript: This cake was scrumptious - it is very light, making it perfect for any time of day, and the abundance of blueberries made it especially delightful. Make this cake!! As I have previously noted, I like my food to have a bit of zing. For this reason, I am a huge fan of curries. Unfortunately, too many curry recipes are high in fat, as they are full of cream, coconut milk and other things that are very waistline unfriendly. I am yet to find a low fat curry that is as good as the full fat versions I have tried at various Asian restaurants and takeaways. However, I have tried a few low fat recipes which are pleasant enough. Tonight, I made one of these recipes for chicken curry. You can see from the photo that this is not a traditional curry, but I was keen to bump up the vege content of the dish by including a packet of frozen vegetables in the ingredients. Drain the pineapple pieces, reserving 1/2 cup of juice. Combine the reserved juice with the cornflour to form a smooth paste as set aside. Ivonne of Cream Puffs in Venice is hosting this month's Sugar High Friday, and has chosen the theme of "The Beautiful Fig". I couldn't agree more that figs are indeed beautiful, whether fresh or dried, and whether in sweet or savoury dishes. There is something remarkably decadent about biting into a sweet, juicy fresh fig, and the fig itself is an object of beauty with its softly rounded shape, purple and green hued skin and pink flesh. Preheat oven to 180 degrees Celsius. Grease a 22 x 12cm loaf pan and line with baking paper. (I skipped the lining part and had a few anxious moments turning the cake out in one piece!). Beat the butter and sugar with an electric mixer until light and creamy. Add the eggs, one at a time, beating well after each addition. Sift the cocoa and flour together, and add to the batter alternately with the milk and combine well. Stir in the figs and half the ginger. Pour batter into prepared pan, and sprinkle the remaining ginger on top. Bake for 1 hour or until cooked through. Cool for 5 minutes in the pan before turning out onto a wire rack to complete the cooling process. Voila! This cake combines three of my favourite things - chocolate (in the form of cocoa), figs and ginger. How could you go wrong? I adore this cake and have made it before. It is luscious, rich and decadent, just like the figs which it contains. Unfortunately, the presence of the figs is not apparent in either photo which accompanies this post, but believe me, they are there! 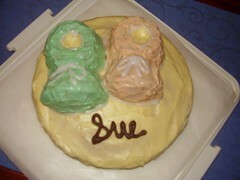 The cake pictured was made for Sue, who also leaves us on Friday on maternity leave. The base is a simple butter cake from The Margaret Fulton Cookbook, but I made three muffin-sized cupcakes and one big cake from the mixture instead of two layer cakes. To make the booties, I creatively sliced and arranged the cupcakes, then iced the whole lot in buttercream, and followed up with glace icing for piping the outline of the booties and the shoelaces. I topped it all off with Sue's name piped in chocolate. This is a simple but effective cake - although it does have its technical difficulties in icing it (but would be a breeze for masters at cake decorating such as Su Yin or Cupcaketastic). Oh no! 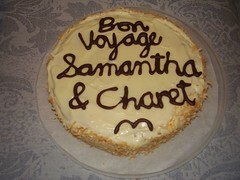 Two of my work buddies, Sam and Charet, are leaving work for greener pastures (and in Sam's case, distant shores!) on Friday. I have had many fun girly lunches with both of them, and will miss their friendship and support very much. The only thing that comforts me at present is that I go on leave on Friday for two weeks, so the impact will be somewhat delayed. I have made Sam and Charet a raspberry coconut cake. I made it early because I am going out to a function on Thursday night and will not be baking anything then! This cake is made from the Froufrou Cupcakes recipe on page 36 of the delightful Australian Womens Weekly Cupcakes. As its name suggests, the base cake contains raspberries and coconut, and it is frosted with a cream cheese frosting. I decorated the sides of the cake with toasted coconut (as was suggested for the cupcakes), and on the top, I placed a chocolate piped message and a seagull (because Sam is going abroad and Charet is going on an overseas holiday). The only real difficulties with this cake were that because I made it as one big cake instead of cupcakes, the baking time was trial and error (it took roughly an hour to bake in my oven), and the raspberries made the cake inclined to stick to the pan and fragile. However, good pan preparation by greasing and lining, and leaving the cake to cool for about 15 minutes in the pan before turning out, alleviated these two difficulties. As always, I can't taste test the cake before it goes public. I will provide an update on the taste in due course. Edward: I'm afraid of heights. Vivian: You are? So how come you rented the penthouse? This is the Best Ever Carrot Cake. No really - I am not trying to be egotistical or facetious. The title of the Kate McGhie recipe used to make this cake, from p316 of Cook, is Best Ever Carrot Cake. And you know what - she is right! This carrot cake is fantastic. It is moist and flavoursome, and quite frankly, I am glad that I took it to work and cut it into 16 slices and shared it with my colleagues, because by gum, I could have scoffed the lot myself. Really! I made carrot cake at the request of one of my colleagues, Matt. I actually prefer it when I get requests, because I know that at least someone will be happy with my choice of baked goods for the week. There is a plethora of carrot cake recipes to choose from, but when Kate boasted that this one was the best, I pushed aside my cynicism and decided to give it a burl. I was not sorry - although I may have been a little sorry for myself when I was grating the 300g of carrot required for this recipe. As well as containing carrot (after all, it is a carrot cake! ), this cake is bursting with nuts (I used walnuts instead of the pecans called for by the recipe) and sultanas. To finish it off, the cake was frosted with cream cheese frosting flavoured with orange zest and juice - but I thought the photo of the uniced cake cooling on a wire rack was far more interesting. I managed not to injure myself while grating carrots, chopping nuts and zesting an orange for this cake. However, I managed to slice into myself while cutting up the cake for degustation at work. Ah well, all in the life of a keen cook. If you are keen to try this cake, let me know. It is seriously delicious - in fact, "it's the best"! A tasty way to prepare beans is Karen Martini's recipe for twice cooked beans with spicy tomato sauce. Karen's recipe can be found in her latest book, Where the Heart Is. The beans are fried in oil and then put aside to drain. In the same pan, you then make a tasty sauce of tomato passata, onion, chilli, garlic, bay leaf, red wine vinegar and sugar. The beans are then added to the sauce, and finally, basil is added (I used basil from a squeezy tube rather than fresh, hence it can't be seen in the photo). This is such a delicious way to serve beans, and I served this dish as a side with my roast chicken to spice things up a bit. I highly recommend it! Tonight, I made roast chicken with parsnips and potatoes for dinner. This is such a simple and easy dish, but tastes amazing. I stuffed the chicken with a simple bread stuffing consisting of 4 slices of fresh white breadcrumbs, dried mixed herbs, an egg and salt and pepper. I then sprayed the chicken with oil, squeezed the juice of a lemon over it, and rubbed the skin with salt and pepper. The parsnips and potatoes were simply peeled, sprayed with oil and sprinkled with salt and pepper and (in the case of the potatoes) sumac. I baked it all together in one roasting pan for one hour and ten minutes at 180 degrees Celsius and voila! Dinner is served.